WOW! 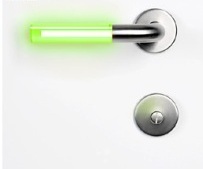 These glowing door handles are one of the coolest door handles that I've seen in recent times. Here's another website offering some related hardware supplies so do check it out too.